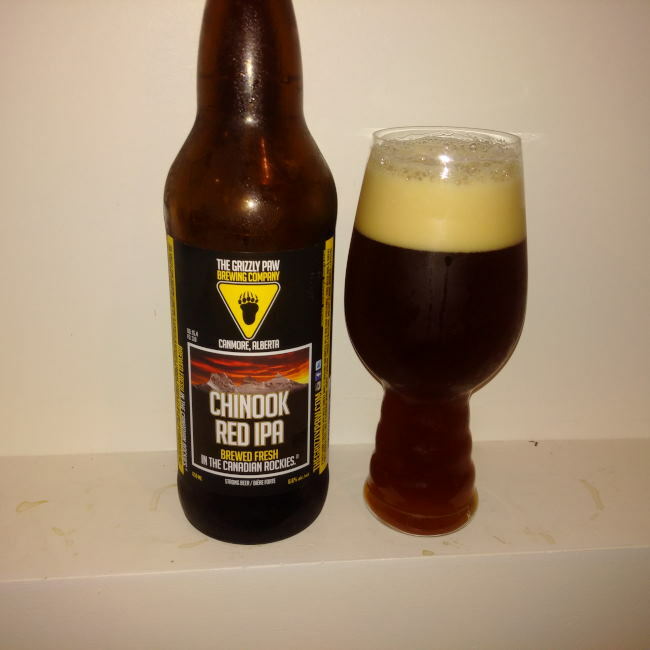 From Canmore Alberta’s The Grizzly Paw Brewing Company comes their “Chinook Red IPA”. The beer pours a deep amber colour with a tan head. The aroma consists of sweet malts, earth, melon, citrus, toffee and brown sugar. The flavour is of earth, caramel, bread, brown sugar, melon, citrus, pine and mild hops bitterness. The alcohol content comes in at 6.6%. This is a pretty good Red Ale but I would not classify this as an IPA in the least. There just is not enough hops bitterness for the style. East Vancouver has yet another craft brewery! 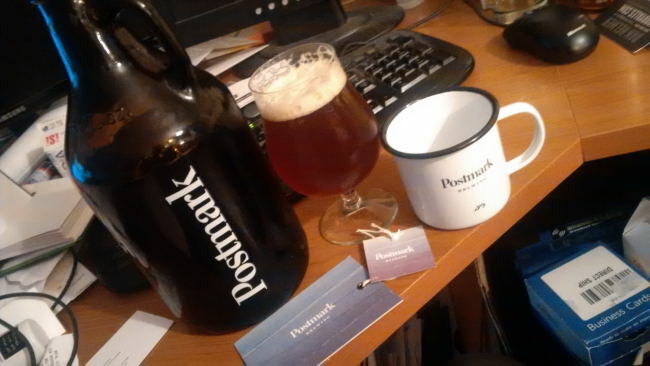 Welcome Postmark Brewing located in Railtown a neighborhood in East Vancouver to the local scene. Their first of 4 staple beers to be ready for sampling is their “Red IPA”. The beer pours a reddish amber colour with an off white head. The aroma consists of floral hops, fruits, sweet malts and some floral hops. The flavour is of a fruitiness including some orange and citrus with pine, hops bitterness, caramel and some mild roasty malts. The alcohol content comes in at 6.2% with an IBU of 50. 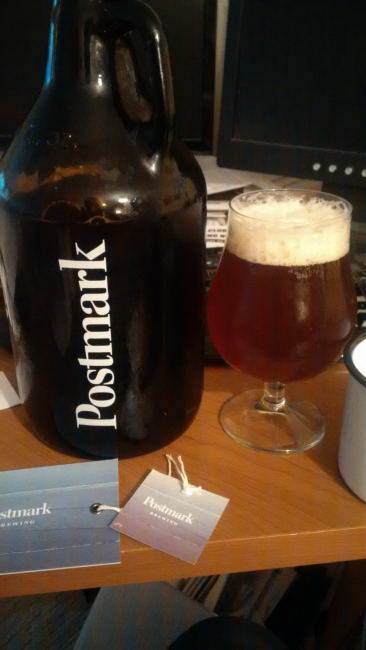 If this beer an indication of what can be expected from Postmark Brewing then people better take notice as this is one mighty tasty beer. Commercial Description: An American IPA full flavoured and well-balanced with a reddish amber color. The beer is medium bodied with a balancing malt backbone, The specific combination of hops leads to a citrus, tropical fruit aroma and flavour, with a subtle bitterness. The IBUs, or international bittering unites, are on the low end of the spectrum at 50, with very little residual bitter hop flavor after taste. This IPA is built to be enjoyed in volume not test your hop endurance threshold. The hop and malt aromas intensify as the beer warms. Food Pairing as per brewery: Curry, spicy Mexican, strong cheese, sweet deserts. 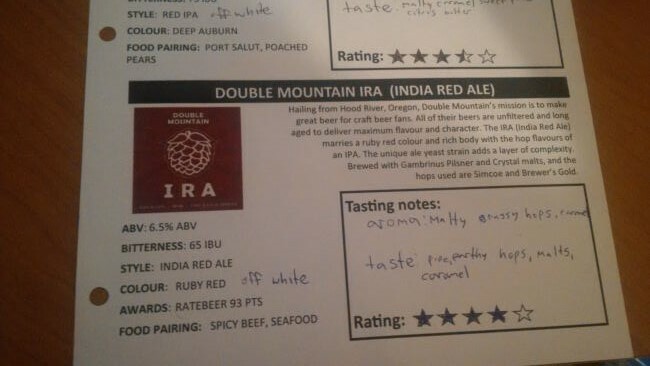 From Hood River Oregon’s Double Mountain Brewery comes their “IRA (India Red Ale)”. The beer pours a ruby red colour with an off white head. The aroma consists of malts, caramel and grassy hops. The flavour is of pine and earthy hops up front with lots of malts and caramel. The alcohol content comes in at 6.5% with an IBU of 65. 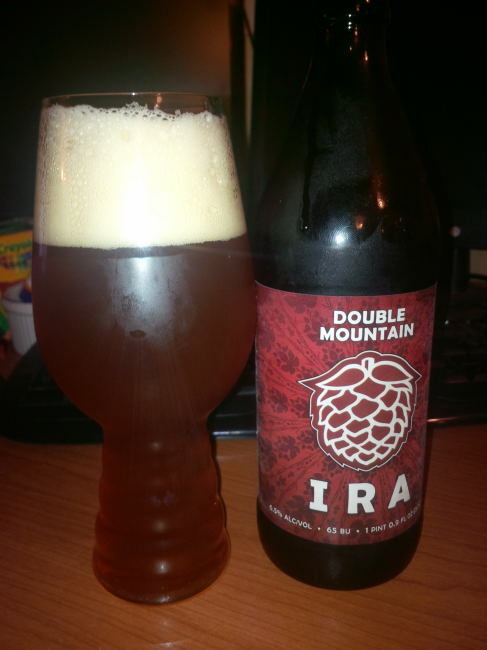 Being a huge fan of IPA’s I was destined to love this beer as it is very similar. This is a beer well worth your time if you are a fan of India Pale ale’s. Commercial Description: The “IRA”, as it’s known around here, marries a ruby red color and rich body with the hop flavors of an IPA. Our unique ale yeast strain adds a delicious layer of complexity. One of the first beers we made, and an enduring favorite.